It includes five of the finest finishing holes you will ever play. The landscape shifts from open meadow prairies to hardwood forests and from farmland to lake views. With 6 strategically placed tees on every hole, Island Hills can be enjoyed by players of all skill levels. Thanks to the richly endowed scenery, each hole has a personality all its own. Ray says, “At the end of your round as you walk away from these unique 18 holes, you have a distinct memory of each and every one.” The area has a wide diversity of landscape. The farmland prairies, low-lying wetlands, rolling pastures, creeks and streams, thick forests, and grassy stretches offer breathtaking panoramic views of Lake Templene. Island Hills is unique in both its bold beauty and its broad and appealing playability. But golf is just the beginning at Island Hills as you’ll quickly learn once you spend even a brief period of time in this remarkable corner of the world. At the heart of the area’s appeal is magnificent Lake Templene. Island Hills Golf Club was built adjacent to this beautiful 1000 acre lake which is famous for some of the best bass fishing in the Midwest. It is one of Michigan’s largest and most pristine inland lakes. It is also a source of constant enjoyment for boaters, sport fishermen, swimmers, bird watchers, and year-round residents who cherish its solitude, serenity and natural beauty. And if that isn’t what you’re looking for, you can always take a short drive to FireKeeper’s Casino for a lively night at the gaming tables. They are all equipped with refrigerator, electric range, microwave oven, ice machine, and dinnerware. There are fireplaces and walkout balconies accessible from the living room areas at BOTH the upper and lower levels of all units. Each villa is equipped with Wi-Fi… Cable TV …and flat screen High Definition TVs in every room. Lower level patios are equipped with gas grills for outdoor cooking. The two spacious living areas in each of our golf villas allow plenty of room to spread out and relax with your friends after a round of golf. OR…you can simply enjoy passing the time playing games and watching TV with your family. There are meeting rooms in every villa. 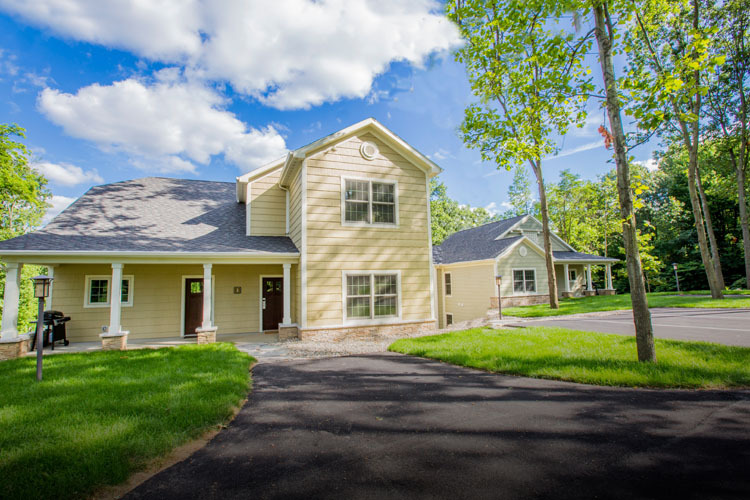 Our Golf Villas are perfect for Business Retreats, Golf Outings, and Family Re-unions. 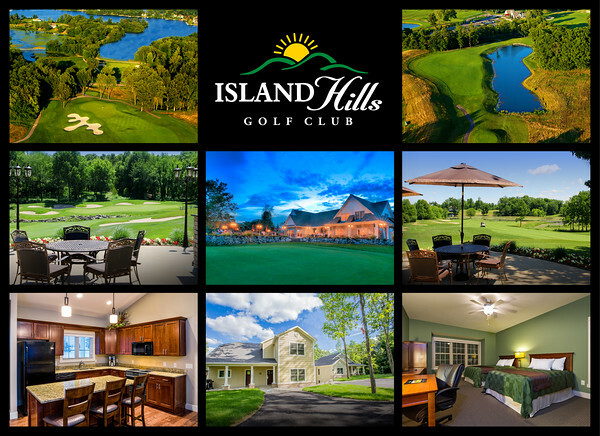 The Golf Villas at Island Hills have been described by golfers and prominent media members as, “simply one of the premiere golf experiences in the Midwest”. 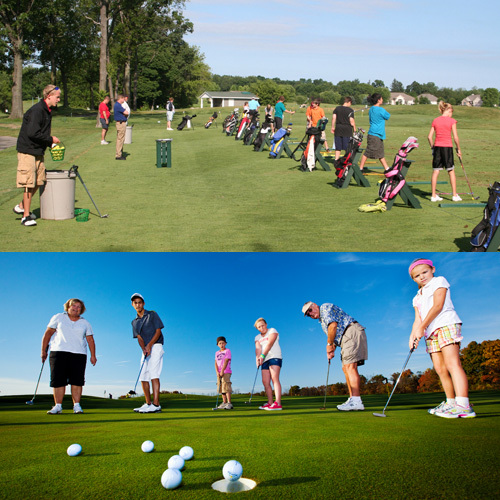 Our practice range facility has been rated in the top 25 in Michigan. It is located adjacent to the Clubhouse and has a driving range with large turf areas to hit from. There is also a large undulating putting green, a chipping area, and a practice sand bunker. It’s a great place to warm up for a round… or to work on perfecting your game. When it comes to your comfort, we work hard to get the details right from the “on-course” bathrooms to the unexpected extras you’ll find on your golf cart which include a towel, bottled water, and a cooler with ice. Call us and book your tee time now.